An unprecedented day for the field of social work took place in Washington, DC, this past September in the historic Eisenhower Executive Office Building. The White House briefing for social workers, “Addressing the Social Determinants of Health in a New Era: The Role of Social Work Education,” included four panels focusing on the importance of social workers as the Affordable Care Act (ACA) moves forward. Event leader Darla Spence Coffey, PhD, MSW, president of the Council on Social Work Education (CSWE), says the “door is open,” and social workers are being recognized for the critical role they can—and do—play in the health care sector. Going forward, this may mean social workers play an even more critical role on the front end of patient care. The tools always have been there and social workers certainly had the capabilities for preventive care, but the field may have pushed social workers more toward working with the “already sick.” Now that’s changing. During the White House briefing, Luptak addressed new expectations of health care under the ACA, while Anand Parekh, MD, MPH, deputy assistant secretary for health for the U.S. Department of Health and Human Services, emphasized the importance of linkages and connectors between the community and health care providers—and the value of social workers in making those connections. This connector role truly will be integral within the new health care model that makes use of an increasingly team-based approach. At a recent Boston College Graduate School of Social Work forum, Massachusetts gubernatorial candidate Charles D. Baker, Jr., also made the case that social workers will be critical within the team-based approach to health care issues, which is valued in this new era. 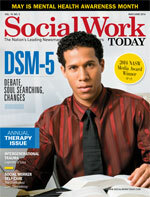 He says social workers already are trained for cross-disciplinary collaboration. “If everyone has a role and if everyone plays a role, good things happen,” he says.